Origins will be supporting Breast Cancer Awareness next month by launching this amazing limited edition duo. The limited edition duo features two Origins favourites on a handy pink clip, Make a Difference Rejuvenating Hand Cream and Peace Of Mind On-The Spot relief. 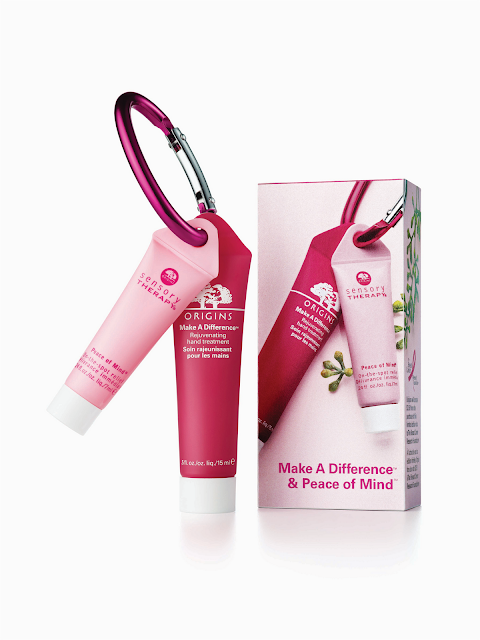 Make A Difference Rejuvenating Hand cream, is great for over exposed hands in need of some TLC. key ingredients such as Rose Jericho, Trehaose and Padina Pavonica help replenish even the most dehydrated hands. Peace Of Mind On-The-Spot Relief contains soothing properties with ingredients such as Basil, Eucalyptus and Peppermint. Peace Of Mind helps to soothe and fight fatigue, massage a few dabs on the back of your neck, earlobes and temples. Origins will donate £2 from every UK purchase. This cute little duo will be available throughout October from all Origins counters, while stocks last. Its so amazing to see so many great bands supporting breast cancer awareness! They're so cute and for such a worthy cause too! A must-buy!